Part two of : Working as a team at Flatbed Press. My day of trial proofing photogravures included a 4″ x 5″ print dear to my heart. This print began on the grounds of the La Romita School of Art in Italy. I took this image while wandering through the olive grove and peeking over the aged stone wall at the back of the property. I had 2 seconds to take this shot, as the Guard Dog performed his diligent duty and herded the sheep to a point of safety from my iPhone picture snapping. Here is our color trial proof (CTP) choice, we will be making a small edition of à la poupée photogravures with a slight modification to the ink color. This small treasure was tediously à la poupéed by Printer, Cordelia Blanchard under the supervision of Master Printer, Tracy Mayrello. I am so pleased by their craftsmanship with my photogravure. This print and 7 other artists’ works that are inspired by the 2 week workshop, will be on exhibit in The Italian Intensive: Umbrian Inspired Artworks from May 9-June 28 at the Flatbed Building O2Gallery and Project Space in Austin, Texas I hope to see you at the artists’ reception on May 16, from 6-8pm. To appreciate the detail and difficulty of this process – below see Cordelia applying the ink with a small brush. I used my iPhone on a trip to Maui to create this capture of the Baldwin house in Iao Valley. I knew I wanted to depict this image in a manner that made you feel the early history not only of the home, but of the ancient landscape. Working as a team at Flatbed Press with Master Printer, Tracy Mayrello, and Printer, Cordelia Blanchard, we spent a day of trial proofing photogravures from a solar plate of my image (made with the assistance of Master Printer, Katherine Brimberry). From that day of press and ink work, one proof was chosen for the final editioning. Here is our color trial proof (CTP) choice, we will be making an edition of 15 chine collé, à la poupée, photo gravures as soon as my shipment of green Kozo paper arrives. This is part of a long term series I am working on: Telescoping Landscapes. It was also nice working with Lola the Shop Dog. (Photo)Toasting Koi. I have enjoyed the PhotoToaster app lately, with all of its great choices for iPhoneography. I am on vacation and couldn’t pass up the beautiful Koi on the grounds where I am staying. This image I processed with the “pale” function. 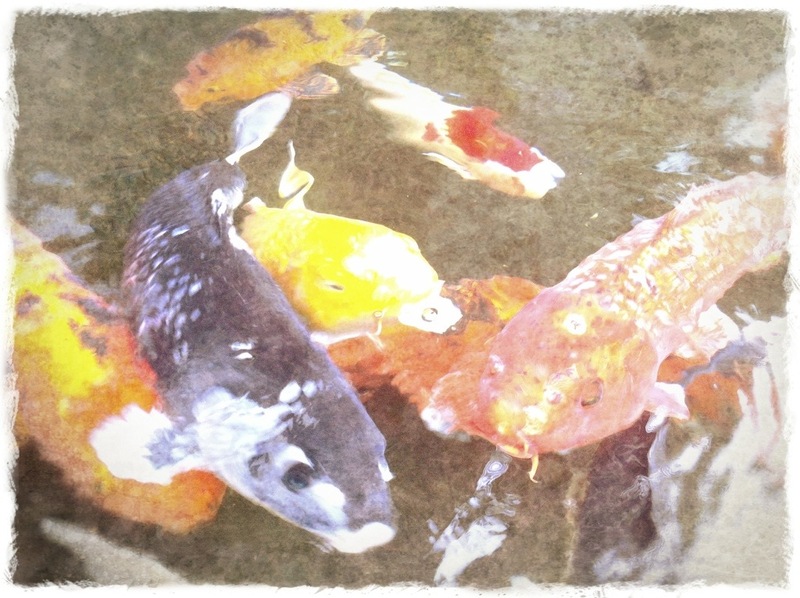 I had so much fun rendering my Koi images – I am going to have to visit the fish again tomorrow! I do love revisiting older iPhone images captured after finding a new app I like. First I used PhotoToaster, which offers a lot of processing options and effects, saved it to the camera roll, then processed the new rendering through Instagram. This is an old tricycle I saw through the window of an abandoned home in Johnson City, Texas.